In her volunteer role with the transitional housing nonprofit DC Doors, Rim Filali recently had one surprising task: to play with children. Turns out, it was far more eye opening than she could have anticipated. By watching the handful of kids, the School of Public Affairs junior allowed their parents—homeless and newly housed clients—the opportunity to receive valuable job training in the small, row house office. As part of her community-based learning course The Latino Community of the DC Metropolitan Area, Filali and six other classmates volunteer each week at DC Doors—doing everything from client interviews and writing housing contracts to cleaning the office each Friday. Founder and executive director of DC Doors Janethe Peña has seen a great benefit for the students as well as for her organization through this new partnership. In fact, as an AU alumna herself, she’s loved having the students complement her full-time staff of three. 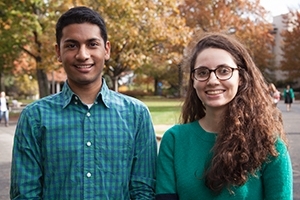 Kogod School of Business junior Roshan Thomas, also a volunteer with DC Doors, appreciates the experiential learning component of his course, which is not unique at AU. More than 24 courses carry the CBL designation, requiring 20 volunteer hours per student at a relevant nonprofit during the semester. In seeing DC Doors move largely Latino immigrant families off the streets and into housing, students have learned about issues of poverty, homelessness, and immigration. At the same time, they’ve seen various facets of a small nonprofit at work. “They get to see how the program is run, how executive decisions get made. They get to interact with clients through social work. They get to see all the different areas that make up a small nonprofit,” Peña said. A business student interested in startups, Thomas is particularly thrilled by this. At the end of their volunteer days, however, both Filali and Thomas are proud that their efforts go beyond simply helping their grades to truly helping people in need and understanding different lived experiences. For them, the fact that these opportunities exist says something about AU’s character. Before the semester ends, both Filali and Thomas will soon lead their own professional skills workshops for clients in hopes of improving their job prospects. But that won’t be the end for either student. As for Filali, she’ll always have the memory of that surprising task and how she’s learned to see—in context—the value of even the smallest gestures of help. “It’s just playing with kids, but there’s a whole backstory to it, which this class has taught me to look at,” she said.